I am ashamed of how long it took me to read this book. I never realised how much I needed my lunch hours and time before bed to get my reading done. This actually having lovely people to talk to at work and having to go to bed early for said work is really eating into my book time! Ah well, the things we do. Unless you’ve been living under a rock, you’ll be aware of the BBC reincarnation of Conan Doyle’s infamous crime solving duo, Sherlock Holmes and John Watson. If you’ve been following this blog for a while, you’ll be aware that I am a huge fangirl for this show. As such, I’ve been slowly buying up the BBC reissues of the famous stories. I have over half of the collections now I do believe which is very exciting. The Memoirs of Sherlock Holmes finally introduces some of the big names of canon to whom we are introduced very quickly in Sherlock: Mycroft Holmes and James Moriarty. The banter between Mycroft and Sherlock in “The Greek Interpreter” was beyond beautiful. It was exactly that scene where Cumberbatch and Gatiss decode the ugly hat in S03E01, “The Empty Hearse”. It’s been a while since I’ve read dialogue this delicious. And finally meeting the original Moriarty? Forget about it. Creepy, genius, evil as all get out? Check, check, check. What is amazing is how much of the original dialogue Moffat and Gatiss actually used in the exchanges between Sherlock and Moriarty in their version of the stories. It made me so happy to make this discovery. Guess what else made an appearance! Go on, guess! The Persian slipper in which Sherlock keeps his tobacco! And the knife he uses to keep his letters nailed down. And the shooting of the wall in 221B! Every time I read these stories, I feel more respect for the BBC showrunners, while also gaining more and more insight into the original canon. Something that does frustrate me, though, is how absent Mary is in the original stories. Her character is such a badass in Sherlock that it never occurred to me that she would simply be a background character after her appearance in The Sign of Four. I suppose it’s a symptom of the times, that female characters were overlooked, but it doesn’t make it sting any less. Though, really, without that gap in Mary’s character back then, we wouldn’t have the fantastic Mary Morstan we know and love today. 2. I do not review books I am emotionally attached to. I’ll talk about them, maybe even mention flaws, but I am far too positively biased towards some books to give an unbiased opinion. The Memoirs of Sherlock Holmes is a must for any Sherlock fan. This is where so many of the exciting things happen: meeting Mycroft, Moriarty, and the Reichenbach Falls. I implore you to read this, because it is an amazing compendium of stories. If you don’t like Sherlock Holmes, it is still wonderful to see how people solved crimes before DNA testing and fingerprint dust. 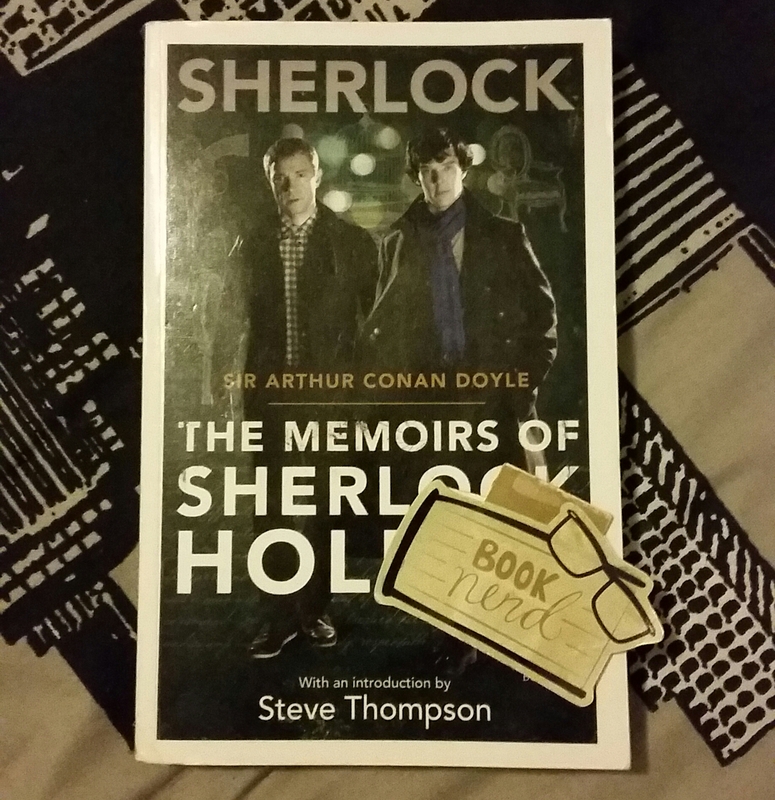 This entry was posted in Extorting Bibliophilia, My Fangirl Life and tagged Arthur Conan Doyle, BBC, James Moriarty, John Watson, Mark Gatiss, Mary Morstan, Mycroft Holmes, Reichenbach Falls, Sherlock Holmes, Steven Moffat, The Final Problem. Bookmark the permalink. GAH, I love Sherlock! About Mary, she seemed more like an accessory in the books, like he thought “How can I prove that Watson’s normal?” and Conan Doyle also wasn’t a fan of his own Sherlock, so he was probable looking for a way to get out of writing novels and get away with short stories. So in the end, Mary’s still a hero cause I prefer the short stories, as the focus on the mystery without all of the observations of the sky.